How served: 750ml corked and caged bottle poured into an Abbeye de Leffe chalice. I paired this beer with: Steamed salmon with onion garlic pan roasted potatoes. Yummy!!! Notes: Cork read best by 03/2009. So this bottle is about 5 years old. This beer poured an opaque deep brownish black with a 2 finger light brown head which dissipated quickly leaving a thin lacing on my glass. The nose was mixed with caramel, raisins (plus other un-named dark fruits) cotton candy and faint chocolate. The taste was slightly sweet with dark fruits like raisins & figs; caramel and brown sugar with hints of chocolate and toffee finishing more on the dryer side. The body was of a light to medium body & extremely creamy and smooth with minimal carbonation; it was as if this beer had come from hand drawn cask. The drinkability was amazingly smooth and easy to drink for a 10.5%abv brew; it drank like a 5-6%er. Overall, is one of the better Quadruples in the marketplace Find it, drink it, enjoy it…then compare it to the best rated Quads you’ve had and you’ll see for yourself why I feel this under the radar and under hyped brew is so damn good!!!!!! 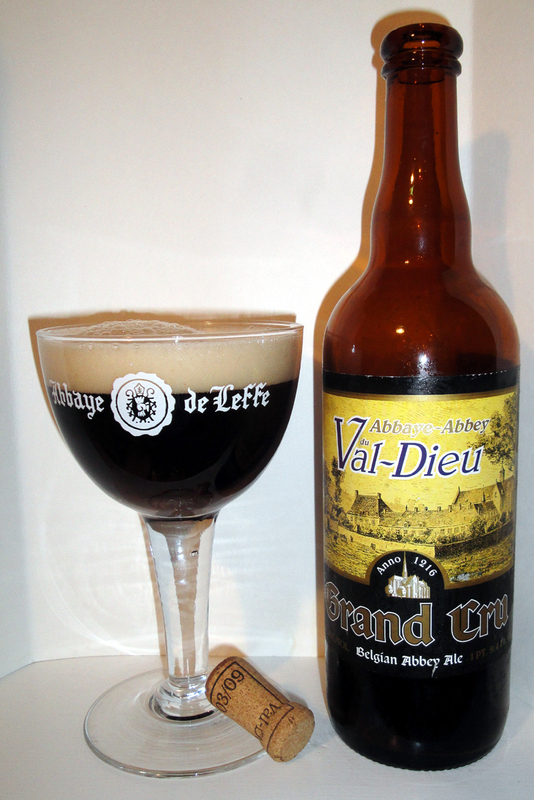 On the Label: This authentic Abbey Ale is based on the recipe perfected centuries ago by the monks of Abbey Val-Dieu. From their website: Un petit bout d’histoire ? The abbey of Val-Dieu was built 1216 by Cistercian monks. They were looking for a lone valley with a stream for agricultural and brewing activities, a haven of peace full of nature. Cistercian orders are well-known abroad for their brewing skills. The monks of this abbey made no exception to this rule. Because of the numerous hazards encountered by the abbey over time (fire, destruction, expulsion of the monks during the Napoleonic revolution), monks have not always been able to brew. That explains why their beer production remained limited to the local level. Fortunately, since 1997, the farm has discovered the typical roar of the brewery again. The only difference with the past is that beers are nowadays brewed by a layman. Moreover, the beers of Val-Dieu are brewed in the former agricultural exploitation. Reinstalled 1997 in the abbey itself, the brewery took inspiration from the receipts formerly used by the brewers-monks of Val-Dieu to make this tradition last. Of course, those receipts had to be adapted to the raw materials and techniques of today. Nowadays, our beers are real abbey beers, of high fermentation, not pasteurized, simple, without seasoning and brewed according to the old infusion method. That is why the small stamp opposite can be found on the labels of our beers. This stamp proves the veracity of our products. To know more about it, go and visit the belgian brewers’ confederation. Tradition, however, does not only apply to our beers. The “pays d’Aubel” is full of products that are emblems of the culinary tradition of the region. In the surrounding orchards, apples are growing which will be used to produce cider and “sirop de Liège“. The livestock which grazes in the green patures will offer you delicious delicatessen. Those are all reasons why you should visit the beautiful “pays d’Aubel” and discover its marvels.